A woman wanted in connection with one of the biggest seizures of animals on the Prairies has left Canada and is living in Jamaica, according to animal welfare workers there. 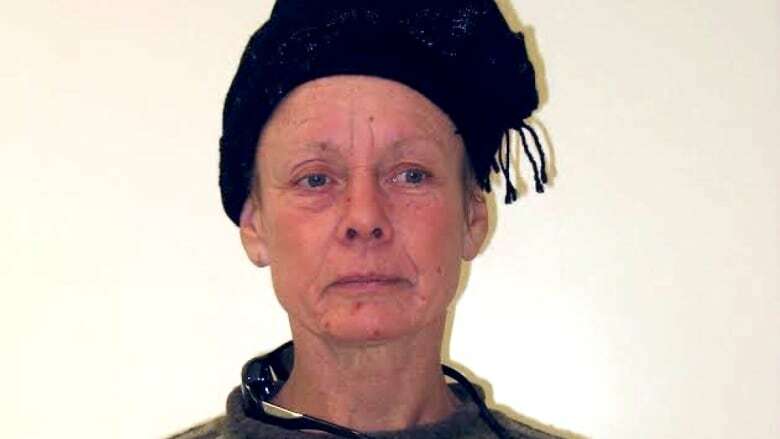 April Irving, 57, has not shown up for court in Lethbridge, Alta., since the summer of 2016. That's where she is wanted on charges of injuring or endangering animals, after more than 200 dogs were taken from her property in Milk River, Alta., two years ago. Irving also had more than 80 dogs taken from her property near Foam Lake, Sask., in 2010. That resulted in her being slapped with a 10-year ban on owning more than two dogs a time. Missing woman, wanted in Alta. animal cruelty case, has history of dog neglect in Sask. Irving's father, along with animal rescuers in Jamaica, say Irving is living on the Caribbean island. 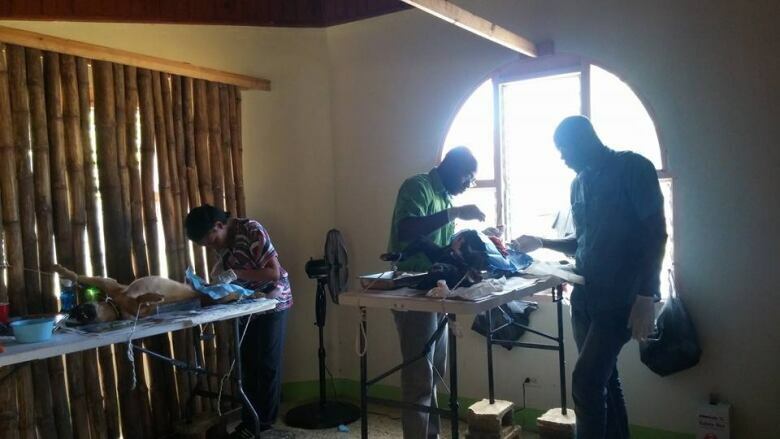 Debbie Lightheart, a Canadian who runs the Negril Spay and Neuter Clinic in Jamaica, said she met Irving, who went by the name "Carol," last year. "She came to one of our spay and neuter clinics with two extremely skinny — emaciated, I think is the word — dogs," Lightheart said. "The one dog should have been put down at that time, because you could tell everything was shutting down on the dog, but she wouldn't take the vet's advice and said that she could heal it." Lightheart said her group followed up with the woman for two or three months, and brought food to where she was living in Negril. On Oct. 12, 2016, the same woman signed in to another spay and neuter clinic in Negril as "Carol." Dr. Calvern Thomas, a veterinarian with the Jamaica Society for the Prevention of Cruelty to Animals (JSPCA) in Montego Bay, was at the clinic and met the woman. He said the woman he met was the same one pictured in April Irving's photographs. Thomas said that "Carol" had a dog that she said she had found on a beach and was caring for. Thomas said the dog was skinny. He said he put the dog on fluids, but it died the next day. "She is doing more harm than good, even though she might intend to do good," he said. Thomas said the woman came to the JSPCA offices in Montego Bay a month or two later, in November or December, looking to adopt a dog. Thomas said he told her there were no animals at the Montego Bay office. "Even if we had animals, we wouldn't have given her [one] because of past experience with her," the veterinarian said. Kaley Pugh, executive director with Animal Protection Services of Saskatchewan, said it's "extremely upsetting to hear" reports that Irving might be living in Jamaica. Pugh said her organization had received an anonymous tip that Irving could be in Jamaica, but had dismissed it. She said it hadn't occurred to her that somebody could leave the country with warrants out for their arrest. "I thought that that was absurd," Pugh said. "It's really unfortunate that there's these loopholes in the system that mean that people who we're looking for here can just leave the country," Pugh said. Cpl. Curtis Peters, with the Alberta RCMP, said Irving's warrants in Alberta and Saskatchewan would not prevent her from leaving Canada from any other province. Peters said that for the same reason police would not be able to arrest Irving outside those two provinces. If Irving were in Canada, he said, the Crown prosecutor's office could apply to bring her back to Alberta to face charges. Jamaican animal welfare workers want to see Irving return to Canada. Lightheart said animal rights workers there are now on the lookout for her. A Canadian can visit Jamaica for up to six months without a visa. Earl Irving, April's father, said his daughter has been in Jamaica for the past six months or so. He lives in Stonewall, Man. Earl said he reaches his daughter by calling a Jamaican phone number, leaving a message, and receiving a call back. Messages from CBC Saskatchewan were not returned from anyone at the number he uses to reach his daughter. He said he is worried about his daughter, but she has told him she plans to stay in Jamaica.